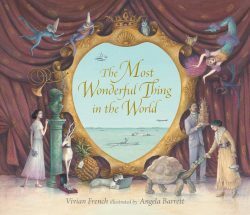 I love the cover of The Most Wonderful Thing in the World. It looks mysterious; the images hold a promise. Here’s a story that’s both very old, and very new, and that’s true. Angela Barrett came to Walker Books with a traditional tale she had loved as a child; I changed and altered it, and (I hope) gave it a new life. The detail here is extraordinary; I’ve lived with this book for over three years, and I still see things that surprise and delight me. What is this world we are about to enter, where a man in a rowing boat waves at another in a sea going car, and a greyhound studies a computer? Vivian French is the hugely popular author of over 200 children’s books, including the Tiara Club and Tales from the Five Kingdoms series as well as non-fiction books such as Caterpillar Butterfly and Growing Frogs. She took some time out from visiting schools in Birmingham as part of the Scottish Friendly Children’s Book Tour to chat to us about persistent bats, her love of comic fantasy and her brand new series of books. What do you enjoy most about writing the Tales from the Five Kingdoms series? I have fun! I’ve created a fantasy world where I can invent cheery trolls, or grumpy dwarves, or helpful bats or worried rats, and I can make them do or say whatever brings the story to a satisfactory (and hopefully surprising) conclusion. Sometimes they take over; I didn’t mean to feature Marlon the bat in all six books, but he refused to be left out. I like it when that happens. Are there plans for another Tales from the Five Kingdoms book? Not at the moment, but I’m writing a new book in the same genre. I love comic fantasy, especially when there’s a touch of evil. The new book has deeply unpleasant ogres, and is based on the fairy tale idea that the seventh son of a seventh son is always a hero. Having written over 200 books is it harder to come up with fresh ideas than when you started writing? It’s not harder to come up with fresh ideas. It’s the voices I have to watch! I like to invent a different voice for each new character, and sometimes I hear an echo of someone else’s speech pattern – and then I have to think again. Which book have you read recently that you would recommend to a friend? Gregory Maguire’s book Egg and Spoon. He’s an extraordinarily imaginative writer; I love the way he takes a traditional story like Babar Yaga and twists and turns it round. Read LOADS! And when you write, write something you really, really want to write … don’t write just for the sake of writing. The book about the seventh son of a seventh son; I’ve nearly finished that one. I’m also working on a six book series called Sam J Butterbiggins, Knight in Training. David Melling is illustrating it, and his pictures are hilarious! YOUNSTERS at Oasis Academy in Streetly Road, Erdington were treated to a visit from an award-winning author this week. Vivian French visited the pupils to give them a lesson in creative writing as part of the Scottish Friendly Children’s Book Tour. Teacher Mrs Hannah Tipper said: “All the children were enthralled and loved it, those who managed to get a signed book were delighted at the special speech bubbles and messages she wrote. Kicking off the Scottish Friendly Children’s Book Tour in 2015 was the wonderful author, illustrator, playwright and poet Vivian French. Over the course of a jam-packed week Vivian shared her passion for stories and imagination with almost 2000 primary school pupils from 11 different schools in Birmingham. A fantastic actor and storyteller, Vivian’s schools event focussed on the hugely popular Tales from the Five Kingdoms series and captivated pupils with tales of a magical world populated with ogres, witches, werewolves, zombies and some very silly royals! Pupils were also encouraged to make up their own stories, resulting in some weird and wonderful tales featuring an angry jaguar, a feisty kangaroo, and an extremely hungry monster. Bells Farm were privileged to welcome the author Vivian French to school on Monday (26th January). She spent quite a while talking to the whole of KS2 about how she writes her books. Did you know she was not very good at writing when she was at school? She was VERY good at something else though… talking! As she was good at talking she later became an actress and then a story teller, that is how she then fell into writing. She met another author who encouraged her to write stories… and so it began. Vivian gave a lot of very useful tips! She said writing a plan was very helpful and that editing work was essential. Vivian once wrote a book and then deleted it all to start again because her editor said she could really needed work on it. Vivian said it was the most important part of writing a story- re-writing parts that needed improving. There is a lesson to be learnt there for us all. Vivian was hugely impressed with the questions that were being asked, so well done all those children that asked one. 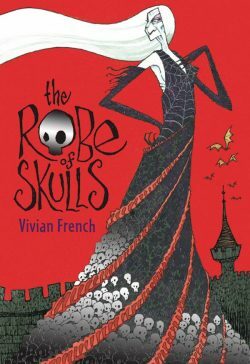 Vivian’s favourite book at the moment is Robe of Skulls and probably the trickiest one to write as it had so many characters and she had to make sure they were in the right place at the right time. Vivian was very impressed! I am not sure her answer was what everyone expected…2! Yes 2! She said she is not very good at descriptions and that is why she finds other ways to make her writing interesting. KS1 were impressed when Vivian told them all about her books on Oliver. She saw the display of their work in the library too and was very pleased with all the work they had done. It was lovely to have Vivian sign bought copies of her books too. Let’s hope Bells Farm are inspired to write! Remember what Vivian said…everyone is a writer. Popular children’s book author Vivian French visited Highters Heath on Monday 26th January 2015. The children have recently been reading books written by Vivian French and Vivian took time out from her busy schedule to visit the children of Highters Heath and discuss how she became an writer and her inspiration to writing stories. During the session, Vivian also answered many questions asked by the children. The children had a fasinating time learning all about her and she was also kind enough to sign books for the children and adults at the end of the assembly. Thank you Vivan French for visiting our school! Who, or what, inspired me? H’m… to be honest, I have a bit of a problem with the word “inspiration.” To me it smacks of unicorns and rainbows and tinkly silver bells, and lady authoresses (is that a word?) draped with gauzy veils gazing out at misty sunsets, and I’m not happy with that. I think of myself as someone who works with words, as against wood and glue and nails; it’s what I do – I’m no different from a carpenter. In a different time my father might have been an actor; he settled for teaching (eventually a much loved headmaster), but he always directed the school plays and was an enthusiastic amateur performer. He wrote a play once; the children howled with laughter, but the adults detected a certain lack of gravitas. He was reined in, and instructed to direct Treasure Island. Right from when I was tiny and very slow at walking (big head, small feet) he encouraged me along by giving me the first line of a silly poem, then waiting for me to suggest the next line before he went on with the third… and so on. He taught me wildly inaccurate nursery rhymes, including several that he’d made up himself; I gravely recited these at nursery school and, aged four, gained a reputation for eccentricity (and inaccuracy). He was also wonderful at reading out loud, and particularly loved books that gave him scope to use his acting skills – and it was through our bedtime reading that I met the Just So Stories by Rudyard Kipling, and became totally entranced with the English language… just like my father. My favourite was The Beginning of the Armadillos, but Dad preferred The Elephant’s Child because he so enjoyed doing the voice of the crocodile. We came to a happy compromise. He read me both stories every night for months and months. I think Kipling’s cadences, humour, rhythms and startlingly original use of words sank deep into my bones; even now I read anything I write out loud, just to check that it feels good in the mouth – but I’ve never achieved anything as perfect as “the banks of the great grey-green greasy Limpopo River, all set about with fever trees”. If ever I did, I’d have my father to thank … to thank for being my inspiration. Vivian French will be visiting primary schools in and around Birmingham this month as part of the Scottish Friendly Children’s Book Tour organised by Scottish Book Trust. 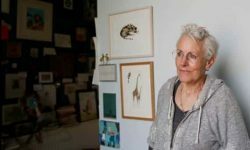 Vivian has written over 200 children’s books including Oliver’s Vegetables, the hugely popular Tiara Club and Tales from the Five Kingdoms series as well as non-fiction books such as Caterpillar Butterfly. Her latest book is The Snarling of Wolves.